Kilmarnock midfielder Chris Johnston has vowed to come back "stronger and better" after suffering a cruciate knee ligament injury during training. The 20-year-old is likely to miss much of the rest of the season. "It's going to be a hard time for however long it is - six months maybe," he told BBC Scotland. "Hopefully I can get back playing this season. I know I'll come back stronger and better. That's the most important thing." Johnston was speaking ahead of kick-off at Rugby Park as Kilmarnock entertained reigning champions Celtic. "This is the kind of game you want to play in - against the best team in the country," said the player capped for Scotland at under-19 level. "Yesterday, I was trying to get back from my ankle injury and then I've done this. "It is a horrible one to get at any time, but I just need to stay positive, do all the exercises, hopefully the operation goes well and get back as soon as I can." Johnston was withdrawn at half-time as Kilmarnock started their season with a 4-0 defeat by Dundee and the injury he picked up then meant he sat out Saturday's 2-0 loss to Aberdeen. 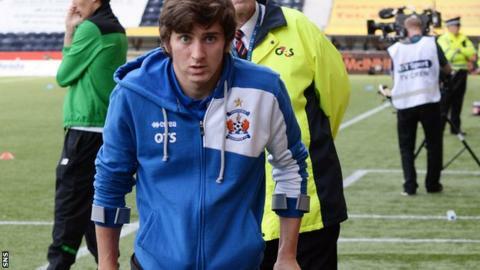 Now the midfielder who made his Kilmarnock debut aged 17 will be missing for some time as manager Gary Locke attempts to halt his side's poor start to the season. "If I beat myself up, it's just going to get worse," added Johnston. "It's happened, I just need to get on with it and stay positive. "It happens, it's football, it's the nature of the game. You've just got to get on with these things. "It will make me stronger. It's happened when I'm young. "It could have been worse. It could have happened when I'm near the end of my career and been unable to come back from it."